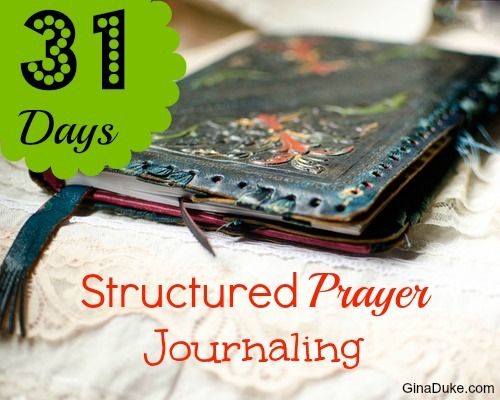 It is hard to believe that we are at day 30 of our structured prayer journaling experience, and yet, here we are! If you are still with me…Thank you! Thank you for enjoying structured prayer journaling, as I do. 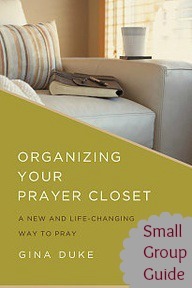 I am very excited to share my new small group guide for Organizing Your Prayer Closet! Get a copy of the book, grab your friends and use this guide to walk through 10 weeks of structured prayer journaling together! Thank you for choosing Organizing Your Prayer Closet: A New and Life-Changing Way to Pray for your small group. It is an honor for me to share structured prayer journaling with those whom desire clarity for authentic Christian living and a disciplined prayer life. 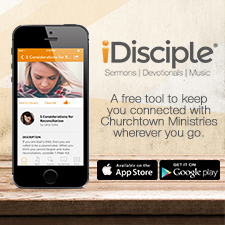 This is an excellent resource for a small group study. My goal in writing this book is to impart 1 Peter 4:7, which is listed at the top right hand corner of each Prayer Closet Organizer worksheet. It says, “The end of everything has come. Therefore, be self-controlled and clearheaded so you can pray.” What this scripture is really saying is that every matter in our lives will conclude one way or another; therefore, it would behoove us to be disciplined and clear-minded so we can effectively pray over those matters. Enter the Prayer Closet Organizer, where we bring those matters, become disciplined and clear in mind to pray. Then see what God does. The purpose of hosting a small group is to share what God is doing with one another, which you will find to be very encouraging. It is really exciting to share and hear how God is moving in each other’s lives. Moreover, we can further learn from one another. So, get your prayer partner, girlfriends, neighbors, co-workers, church group or other small group together and begin to share your prayer time together with more clarity than ever before. This guide may also be used for personal study. Begin with an introductory meeting to insure everyone has their book and understands how to organize their Prayer Closet Organizer (See “Quick Guide” below). Introduce the format of the small group meeting. Share the confidentiality rule and other good small group etiquette expectations. Discuss 1 Peter 4:7. Stress the importance of scripture memorization and Bible study as outlined in the other “Tips for Success” that are listed below. Commit to make meeting weekly a priority and agree upon the best day and time, and follow the “Recommended Small Group Format”. The participants will get the most from this small group study experience if they are utilizing the Prayer Closet Organizer while studying the chapters. As they study each chapter, they will find that their entries will become more refined. This will be a beneficial aspect of their learning curve. Encourage the participants to memorize the scriptures in the headers of their Prayer Closet Organizer worksheets so they will be prepared to recite a few of them at the meetings. Create an environment where the participants will feel free to laugh at themselves, share their disappointments, discuss serious struggles, cry when upset, celebrate with praise and thanksgiving, and most of all, be themselves. Encourage your participants to study the whole chapter or story in the scriptures of any biblical illustrations Gina uses in her chapters, so they can further glean even more clarity and additional precepts on prayer. Invite participants to bring their different Bible translations, concordances, commentaries and other resources to use as reference material for the “Scripture Study” exercise. Take the liberty to use the recommended elements from the “Small Group Agenda” for each chapter that works best for you and the participants. Don’t feel as if you have to do every one of them. You can always circle back and do the others on a second or third round should your group continue. When your small group has met for all the chapters, you may either disband or continue to meet to share and pray with one another. Once this study ends, challenge your participants to multiply by initiating their own small group for Organizing Your Prayer Closet. 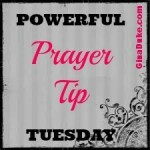 Go to the category for Prayer Journaling at ginaduke.com for more resources and videos to use as extra material. Scripture Study – This is a stand-alone exercise to further investigate the chapter’s topic. Discussion Starters – These questions facilitate personal reflection and small group participation regarding each chapter. Twitter Tweetables – Each small group discussion ends with the opportunity to join a larger conversation on social media. Look at each compartment of the weekly worksheet, one at a time, and reflect on your day. Write down your thoughts as they come to you – this is organizing your prayer closet. Using the scripture headers, pray the word of God over your input. Every Sunday, start a new worksheet. Periodically review past week’s worksheets and update accordingly. Scripture Study: Psalm 47:7. Review several translations and reference resources, then discuss findings. Share a time you felt engulfed by God’s presence whether it was in corporate worship or a personal setting. Give details so everyone can be blessed by your experience. Using a title of a hymn/worship song, a scripture or a title for Jesus, explain what you think about the Christ? Share one emotional void Jesus fills for you. Explain how embracing “boring” has helped you sustain a thankful attitude. What serious event has happened in your life that made you more thankful for simpler things? What are some of your current complaints that you can reframe into statements of thanksgiving? What difficulty have you overcome through using words of thanksgiving? Read the following scriptures and note the subtle interjection of variances of the word “thanksgiving.” Then discuss how this frequently unnoticed word changes the context of the scripture in relation to what you have just studied in chapter 1. Scripture Study: Proverbs 6:23. Review several translations and reference resources, then discuss findings. Do you ever give much thought to your personal failings or sins? Why or why not? What did this new revelation about James 3:2 mean to you? Did you find it helpful and liberating? If so, why? How did you feel when Gina shared her struggle with the frowny-face sin? 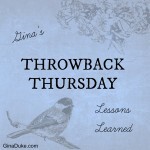 Why do you think addressing personal failings spiritually matures you as Gina suggested? Scripture Study: 1 Corinthians 14:15. Review several translations and reference resources, then discuss findings. Have you failed to pray for someone whom had asked you? Prior to reading Ecclesiastes 5:2 did you have some prayer requests that were lacking in eternal value like Kassie’s request for snow? Before reading chapter 3, did you struggle over how to pray for healing? If so, share why. How have you liked utilizing the Ask, Seek, Knock prayer strategy? How has praying scripture with your petitions helped you pray more effectively? In addition to utilizing the divine titles and attributes of the Trinity which are summarized below, brainstorm some others for prayer. For example, Gina encouraged us to pray for provision (Jehovah-Jireh) after a job loss rather than another job in case God has something else in mind. We can better learn how to pray God’s will when considering divine titles and attributes of the Godhead. Now it is your small group’s turn. Using some of the participants’ current requests, discuss some other divine titles and godly attributes that can help them pray more effectively? Don’t forget to share the scriptural reference! Scripture Study: Deuteronomy 32:4. Review several translations and reference resources, then discuss findings. How are you beginning to see God move in your prayer requests? Now that you have learned how to craft a higher quality prayer request, share some of your before and after examples of a prayer petition. How has God used a No to more clearly demonstrate the magnificent characteristics and manifold wisdom of Himself in your life? Considering Job’s experience and his resolve in Job 13:15, how have you committed to adopt this attitude? What are your thoughts about Gina’s perspective on how “God allows and disallows all that happens to us”? You have been doing structured prayer journaling for about four weeks now. Draw a pie chart and designate the slices according to the Yes’s, No’s, Open and Unknown answers from you Prayer Closet Organizer thus far. Present your illustrations to one another and discuss. Scripture Study: Lamentations 3:24. Review several translations and reference resources, then discuss findings. How can you relate to Gina’s pastor’s remark that “Everything that happens to you is not about you”? Has there ever been a time when you recognized God’s perfect timing through a series of events? Tell your story to the group. Have you ever felt annoyed at God when you were having to wait for what seemed like eternity to get an answer to an urgent request? If so, explain how that experience made you feel about God, and yourself. If you are currently waiting for an answer, would you say that you are waiting well? If so, how are you serving God during this time? 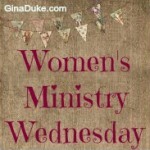 Like Gina, have you ever failed to wait on God, only to realize later what it cost you? Feel free to share. Using a scale like the one below, rate how well you typically employ patience while waiting on God with 1 being pathetic and a 10 being perfect. Share your ratings with the group and explain why you graded yourself that way. Tweetable: I’m serving God while I wait by (insert type of service) @TheGinaDuke #OrganizingYourPrayerClosetBook #Patience. Scripture Study: Philippians 2:13. Review several translations and reference resources, then discuss findings. Would you say that you are more of a Christian consumer or contributor at this point in your life? Describe the time you either dedicated your life to Christ, or like Gina in Chapter 6, recommitted your life to Christ. Where has God opened “a great door of effective work” for you? Tell about a time God gave you a vision for a ministry endeavor. How did it turn out? What are some examples of creative callings that either you or your friends have? How do you feel God is using various experiences to groom you for your ministry calling? Take a moment to make a general invitation to come to know Christ personally. This time is not meant to embarrass or pressure anyone into a decision, but to answer questions, offer scriptures and have a time of prayer. Scripture Study: 1 Peter 4:10. Review several translations and reference resources, then discuss findings. How has the expression, “Everybody Spends Eternity Somewhere” created a sense of urgency in you to share the gospel? Is there someone whom you are too intimidated by to share the gospel? If so, how can you creatively witness to them? Whom has God placed in your spiritual custody? In what profession or positions do you feel that God is using you “to make known the will of His sovereign”? Based upon II Corinthians 6:3, describe a time when you felt you may have created a “stumbling block” to another person due to bad behavior. List those whom are within your circles of influence by group (family, friends, neighbors, work, other), then ask yourself how you can minister or serve them in such a way that is representative of an Ambassador of Christ. This exercise will provide you with a focused list of those you need to become more intentional with in order that they may be reconciled with God or another. Scripture Study: Proverbs 9:10. Review several translations and reference resources, then discuss findings. Share your thoughts about God’s instruction on consulting mediums or using other occult methods for trying to obtain “inside Information”. Tell about a time when you did something extreme in order to satisfy your curiosity. Do you have a prayer request where you are beginning to see the evidence of your faith? If so, share what you are seeing. How did the biblical accounts Gina used in this chapter help you see that God’s answers are not always immediate or evident? Does anyone have a dream from God that they believe has died or is at the “brink of death”? Share with the group how you have been able to pray for someone because you had special insight into the person’s background. Consider Deuteronomy 29:29 and evaluate the various ways we ascertain the “revealed things”. Private conversations from the individual. Discernment by the Holy Spirit. Scripture Study: Psalm 32:8-9. Review several translations and reference resources, then discuss findings. Who has an experience to share of when you unequivocally knew that God had spoken to you about something? Who do you admire for their well-developed “ears to hear”? What have you learned from them? Has God led you to reach out to someone as Gina did to Joy with a card and scripture? What happened? Do you have any question marks with your entries in this department because you are still trying to figure out if it is indeed God speaking to you? Do you mind sharing them and why you feel they are questionable? When has God brought something back around to you two or more times, causing you to wonder if it was God speaking to lead you? Have your group draw the chart box below and follow the instructions. Just like an audiologist might give you an audiogram to gauge how well you hear frequencies and pitches that determine your overall hearing range, chart your range for “ears to hear”. Normal hearing range is 0 to 20 decibels, which is Good. The higher the decibels in the left column the less you can hear. Draw a dot in the square that best describes your ability to hear God with 20 being normal range and 60 being spiritually deaf in that area. Once you have placed your dots, connect them in order to get your spiritual ear audiogram. How well do you hear God when He is leading you to do something? How well do you hear God when making personal decisions? How well do you hear God when dealing with others? How well do you hear God when He convicts you of sin? How well do you hear God when discerning truth in a situation? Based upon your data, in what area do you need better “ears to hear”? Scripture Study: II Thessalonians 1:11. Review several translations and reference resources, then discuss findings. Describe how you felt after you ignored God’s prompting and later realized the gravity of the consequences? Have you ever made a deviation from God’s plan? What issues developed due to that deviation? What has settling for less than God’s best plans cost you? Are you being discouraged right now from following through on something God has led you to do? Can you make a public commitment to your group that you will persevere? Has God ever led you to follow through with something that sounded downright bizarre? What is something God has stretched you to do that required radical obedience? Utilizing Gina’s Rule of Thumb from Ecclesiastes 8:5, succinctly list what God has asked you to do under the words, ”God’s Prompting.” Next, write down the details of what you know to do in order to execute it under “Proper Procdedure”. Once you have all of the “Proper Procedure” you can then write in the date, event or season that marks the “Proper Time”. This is when you know you are ready and prepared to execute what God has given you to do. Here is a link to my Word document. I wanted to post the whole guide in case you could not open this link. Once I get it into a PDF file, I will re-post it.